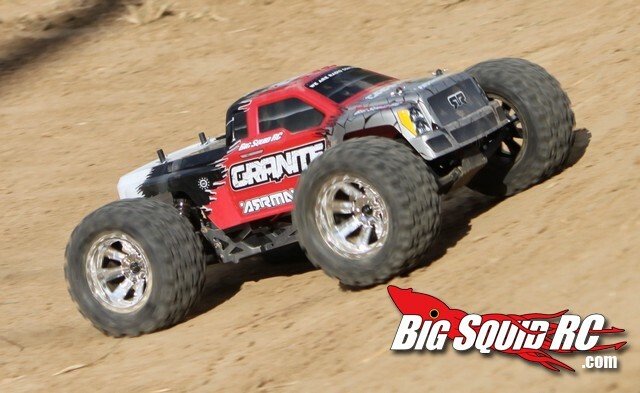 ARRMA Granite Review « Big Squid RC – RC Car and Truck News, Reviews, Videos, and More! What’s Needed To Complete: You’ll need 4 AA batteries for the transmitter, a 6 cell Ni-mh battery for the truck, and a battery charger. Build Quality: The truck was well put together. Nothing was binding, the gear mesh was properly set, no oil was leaking from the shocks, and we didn’t come across any stripped or loose screws. Test Venues: Leisure Hours in Joliet Illinois, RC Outlaws in Collinsville Illinois, a Costco parking lot and my backyard. Set-up Notes: We used Venom AA batteries in the transmitter, and both an Onyx 2000 mah 6 cell Ni-mh, and a MaxAmps 2S 4200 mah Lipo to power the truck. To handle the battery charging duties we used a Hyperion 720iNet3. Turning: The Granite does not steer well out of the box. 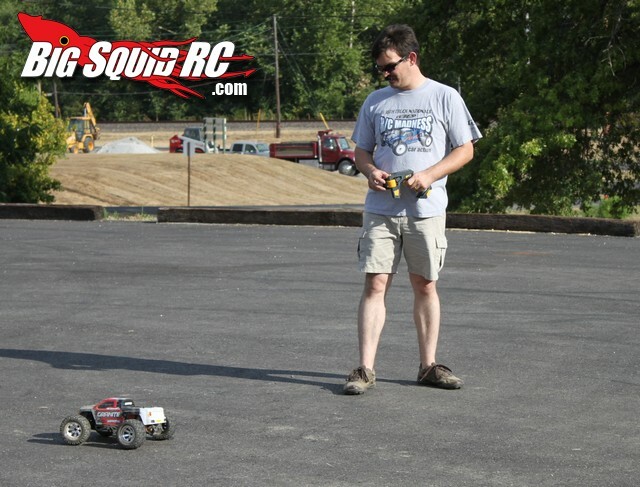 It steers better to the right than the left, and the stock servo is both underpowered and quite slow. You’ll need to make sure that you either enter corners quite slow, or start steering well before the corner to make sure you get turned around where you want. However… the stock steering/servo did not keep us from having an absolute Blast driving the truck. You get used to the way it steers fairly quickly. Jumping: The Granite is a good jumper. 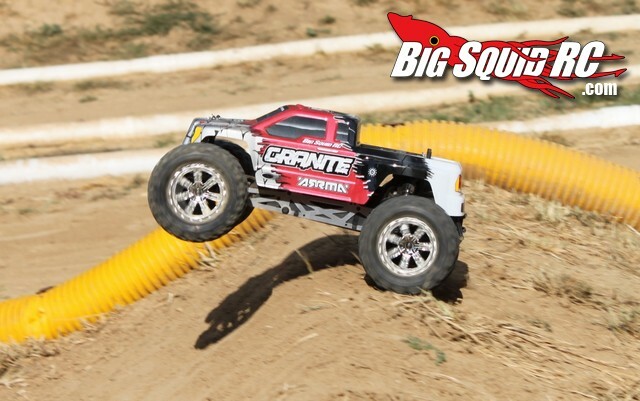 Most brushed powered RTR’s don’t have enough power to make mid-air corrections, but what the Granite lacks in shear power it makes up for in rotating mass with those big tires. If the nose is too low, pin the throttle and those big tires will slowly bring the front up, if it’s too high in the front just stab the brakes and the nose slowly rotates downward. Nasty jump faces don’t seem to faze the Granite either. Overall, it’s a pleasure to catch air with the Granite. Landings however can be a different story. The rear of the truck soaks up landings just fine, but because of the geometry of the truck, the front of the chassis can’t bottom out resulting in a nasty bounce from the front on hard landings. Bumps/Whoops: Big tires plus lots of suspension travel result in a truck that is extremely well behaved in the rough. 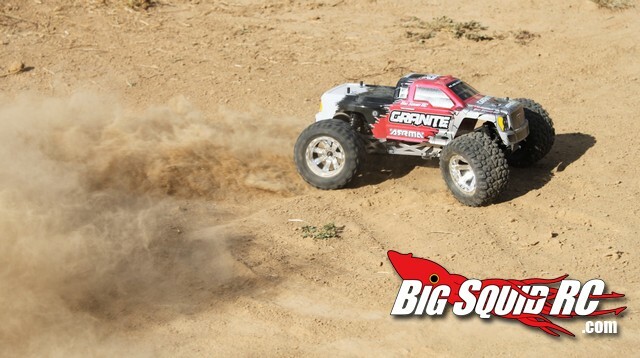 The Granite is easy to drive in gnarly bombed out sections. Kudos. On-Road: You can have a blast wheeling the Granite on-road, despite the slow turning. Once again it’s just something that you get used to, and once you get used to the steering it’s game on. 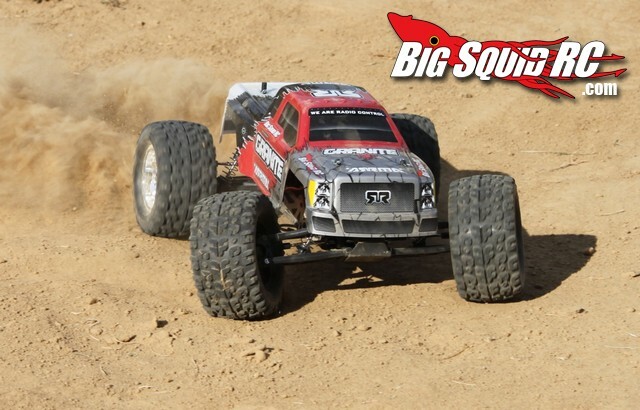 Tires: Traction on dirt was not their strong suit, but they had enough grip to have fun. 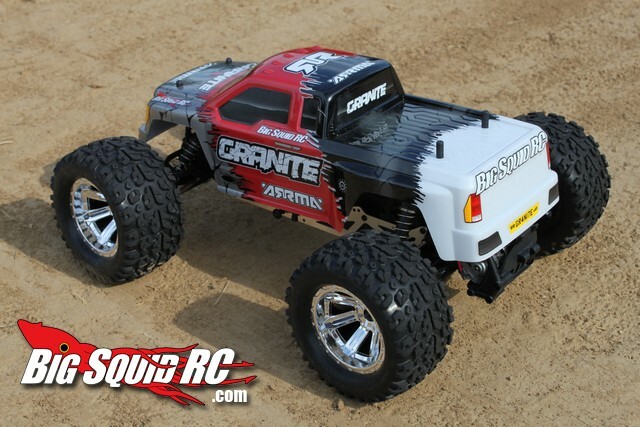 If you plan on driving exclusively on dirt, I’d be cruising the Pro-Line website to find some new shoes. On-road, the tires worked well despite their soft inserts. Mechanical grip was good on-road, without having so much side bite to instantly flip the truck during hard cornering. Power: You’ve probably driven one of the new generation of brushed RTR’s. I’m talking about something like a brushed Slash, Blitz, etc. The Granite has that level of power. If you haven’t driven one of those, here’s the scoop. 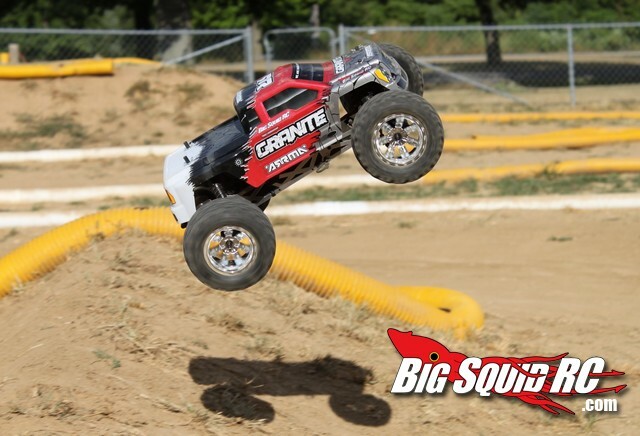 The Granite has enough power to spin the tires on dirt, enough yank to pop small wheelies from a dead stop, and a mid 20 mph top end on Ni-mh batteries. There’s enough power on tap to have fun, enough to make some pretty decent sized jumps, and enough top end speed to have fun on pavement. But, pop in a decent Lipo and you’ll instantly have 30-40% more power on tap, making it even more fun. 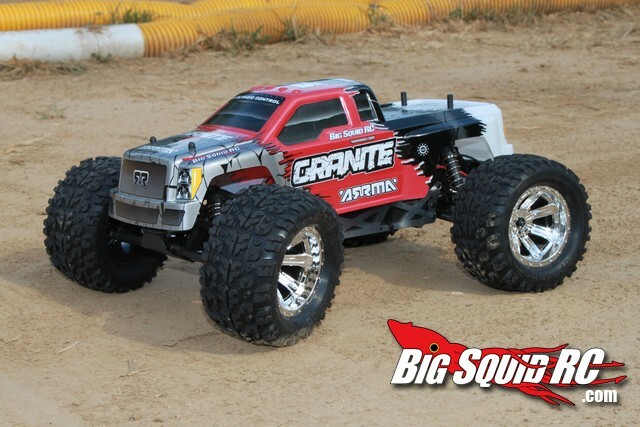 However, if you are used to 3S brushless that Granite will feel slow, which compared to big brushless power, it is. To boil it down, the stock power-plant is perfect noob power, and enough to put a smile on us old school vets. Radio: Yes, the Granite comes with one of the most radically designed radio’s you’ll ever see. The wheel is actually able to rotate from the right to the left hand side with the press of a button. Range was outstanding, and the 2.4 GHz comes in handy when driving with other people. One of our reviewers really, really, liked the feel of the radio, but I felt the spring rates on both the trigger and wheel were a tad too stiff. I also didn’t like the ergonomics of how far away the wheel was from the trigger. Before I give a listing of what we broke, I need to state the torture test we put it through. We hucked the Granite off a 1 story roof a half dozen times. We hucked it off the peak of a 1 story roof twice. We drove it full speed into a cement block wall a half dozen times. We drove it full speed into a tree. We drove it full speed into a trash can. We drove it full speed down a large hill into a cement block. We hucked it full speed down a flight of cement stairs 3 times. We drove it wide open down a large hill into a trash can. We slammed it full speed into a railroad-tie 3 times. Look at the video, we gave the Granite an Armageddon type beating. And that was on top of our “normal” parking lot and track bashing. Actual broken parts, just one, the plastic front top-plate. Bent parts, just one, the metal front bottom kick-up plate. 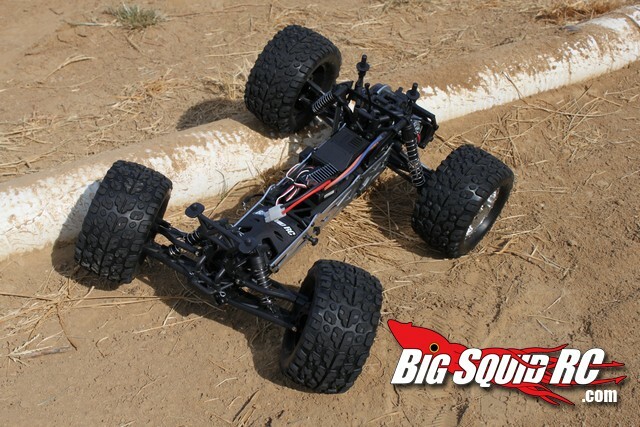 The motor tended to slide around during huge hits, and we had the tie rods pop off a few times at the front wheels. The motor wire plugs came unhooked a few times on huge hits too. Other than that, no issues. The name of the truck is the Granite, and after the epic torture testing we put it through we were beginning to think it was MADE out of Granite. We have yet to buy one part for the Granite, and today it sits in the office in nearly perfect working order. The bottom drop down battery tray works perfectly if you are using a 6 cell Ni-mh pack. If you are using anything else it’s a huge PITA. Best Mod Under $5: I’ve got a few here. First, larger washers for the motor screws, these will help keep the motor from sliding around during big hits. Second, some Dubro captured rod ends for the front outer steering tie-rods. The stockers like to pop off, but the Dubro units will completely solve that problem. Also, a new pinion gear 2 to 3 teeth smaller than stock would be good. The Granite is geared for speed out of the box, in fact, geared slightly too tall for it’s tire size and mass. A smaller pinion will yield more reasonable motor temps and produce more low end yank. Oh and one last mod, cut off the goofy Tamiya connectors and solder up some real Traxxas plugs. Oh and, seriously, just one more less than $5 mod- solder the motor wire plugs together. Best Mod Over $5: A new Hitec steering servo. The stocker is usable, but a Hitec servo will be the single best thing you can do to enhance the driving of the Granite. Time To Bash – 9.0/10 -Pretty standard here, pop 4 AA’s into the transmitter and a charged 6 cell into the truck and you are ready to jam. Workability – 7.0/10 – The twin spar frame makes wrenching a bit harder than on a flat chassis. Car Show Rating – 8.0/10 – Big chrome rims and a nicely painted shell result in a nice looking truck. Bash-A-Bility – 9/10 – Yes, after a sadistic beating we were able to break one part. Overall, one extra ordinarily tough truck. Fun Factor – 9/10 – Great fun huck’n off roofs and bashing over rough terrain. Handeling – 7/10 – Great jumper, great in the rough, but overall handling is held back by its steering. Value- 9/10 – At $200 it’s quite affordable and loads of fun to drive, that’s a good value. 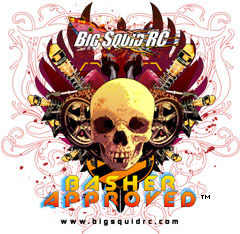 Big Squid Rating – 8.3/10 – Tentacles.. 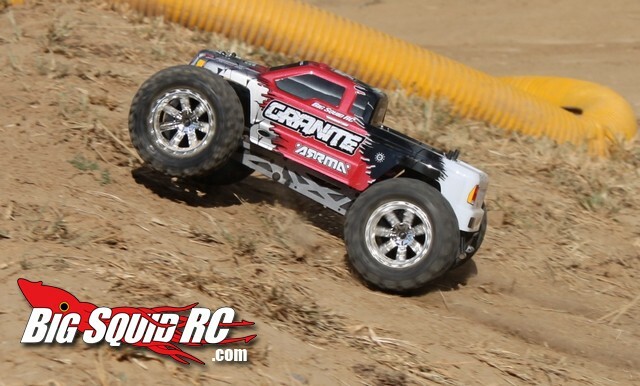 I highly recommend the ARRMA Granite, it is simply a Great basher, perhaps one of the best money can buy. Here’s that video we talked about.. it’s insane what we did to this truck!